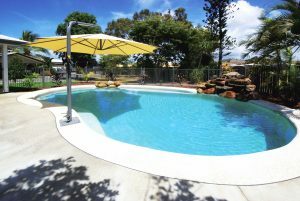 Beat the Central Queensland heat this summer in your new custom concrete or fibreglass swimming pool from Rockhampton’s most trusted and reliable swimming pool builders. We offer fully-customised premium concrete swimming pools shaped to your preference, with optional extras including freshwater systems, premium pumps and filters, pool features, landscaping and poolside gazebos. We are proud to work alongside a specialised foreman who has over 17 years experience in concrete pool building in the Rockhampton region. We also employ a highly skilled team of local concreters and interior plasterers, to ensure your new swimming pool is finished to perfection and enjoyed by your family for years to come. We are excited to work with award-winning Australian manufacturer Freedom Pools as their installation agent for Central Queensland. Freedom Pools has been an industry leader for 40 years and offer an extensive range of premium swimming pools and spas, both large and small, to suit your home. Their fade-resistant fibreglass pools are made using superior grade eco-friendly fibreglass and gelcoats, and come with a lifetime structural warranty. View the full range of Freedom Pools and contact us today to find out how our swimming pool builders can assist you to build or install your new swimming pool.